Each year millions of students across the world put away their computers and pick up their pens. Exams that can be moved to on-screen delivery have already been moved, this leaves them with no option other than to write. Replacing paper exams with computers is a daunting prospect for all involved. We have created a simple but effective solution which enables the secure use of computers without any change to the existing process. 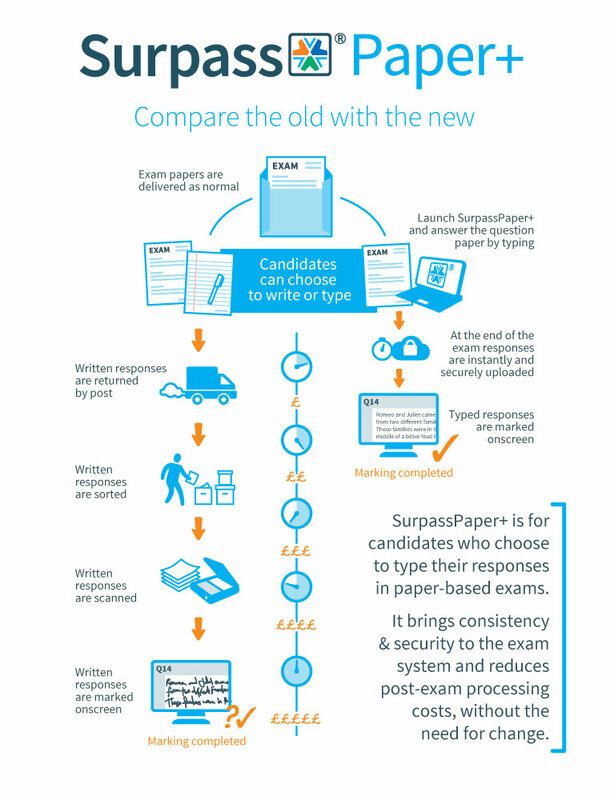 SurpassPaper+ is the evolution of paper examinations. We are so excited about how SurpassPaper+ could change the way we manage assessment in our school. It is exactly what we have been looking for: a simple solution for providing pupils with the opportunity to type in exams. SurpassPaper+ is a secure word processing app designed specifically for examinations. Students download the SurpassPaper+ app to their device prior to the exam and no question content is downloaded. 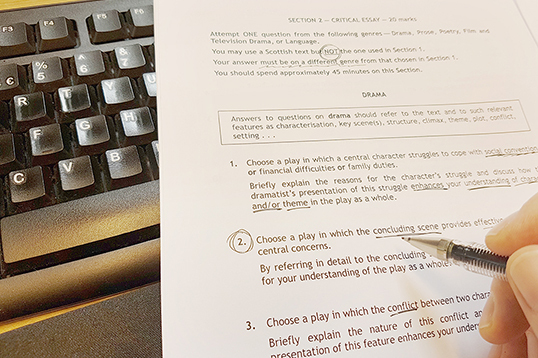 On exam day, students are given the exam question booklet as normal, the difference is that they can choose to use any supporting device to type their responses, or write by hand as before. Typed responses from SurpassPaper+ are submitted instantly and securely for marking, handwritten responses by other candidates are posted back as normal for scanning. The real genius of SurpassPaper+ is that it can work in parallel with existing paper exam script processes, which is why we believe it is a realistic evolution in a traditional process. With no change to the distribution of exams, awarding organisations can work with centres to unlock the potential of digital technologies without significant infrastructure changes by anyone. Students who wish to use SurpassPaper+ simply enter their candidate details as before, type their responses, and submit electronically. SurpassPaper+ is an easy to use, secure, and reliable application, giving students and schools the choice to take a paper exam on-screen on any supported device. This unlocks the potential of computer based delivery, without the stress and strain of a complete, full scale move to on-screen testing. Students now have the choice to use computers or tablets that they are familiar with and are part of their normal way of working. Awarding organisations can benefit from the digital capture of students’ responses, reducing the time and costs of the exam process without changing exam delivery. SurpassPaper+ supports a growing trend in the use of computers by students, without interfering with those that choose to handwrite exams. 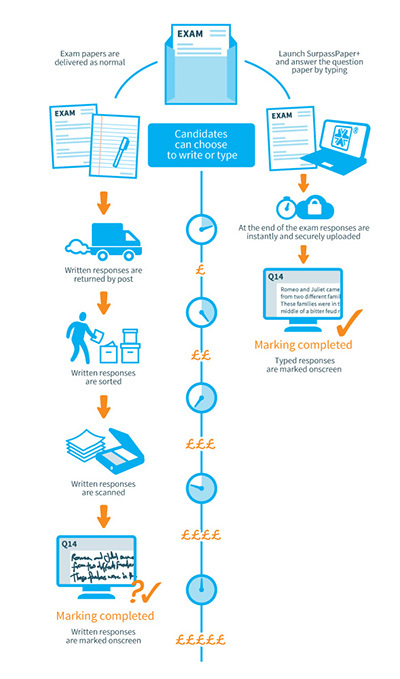 Captured responses can be marked more efficiently and quickly in awarding organisations’ existing on-screen marking tools. How much setup is required? All that is required is for students or centre staff to download the application. The student uses the paper exam script as before, so no digital exam materials need to be distributed. This reduces the load on the school or centre as they don’t need to invest in infrastructure to support the exam. The application could be used as part of the mock or practice exam process, so students will already be familiar with the application. What if the student’s device fails? SurpassPaper+ has been designed to handle problems such as device failure whether it occurs before, during or after the examination. If the device fails before the start the candidate can just be given another device to work on, because only the app needs to be downloaded and no candidate specific data. Alternatively they can choose to work on paper as before. This is the same during the exam: responses completed online up to the point of failure can be easily accessed and continued on another device, or have a written response submitted alongside them. Because SurpassPaper+ is an application for capturing responses and not delivering exams like traditional computer-based testing, it doesn’t become a single point of failure. Invigilation tools also make it easier to spot potential problems and deal with them before they happen. Yes, SurpassPaper+ prevents candidates from accessing other applications and the internet, therefore it is more secure than using Word or Excel and even increases the chances of identifying exam fraud than handwritten responses. How will it impact the students? SurpassPaper+ gives more choice to the students. 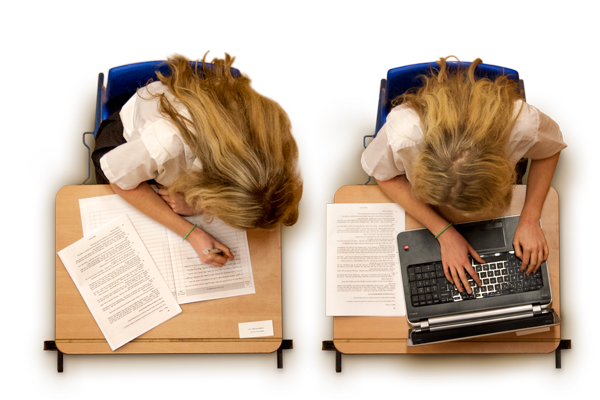 They can choose to take an exam on a computer, something they have used regularly whilst learning and preparing for the exam. Or, if they are more comfortable, just carry on as they have before and handwrite the response. For students who find it difficult to handwrite, they will find they will no longer lose marks for illegible handwriting. Their grades will improve, as will the performance of the school and the appeal of the awarding organisation. Are the questions on-screen or on paper? SurpassPaper+ is only used to capture the answers provided by the candidates, and does not present the questions or source material; this is still done through the use of a physical question paper. Having the question paper present can be important to some students, as it provides the ability to annotate, underline and read the questions and source material before using the app to plan and complete their full response. You can be among the first to take part in the evolution of assessment. It all starts with a simple contact form. Occasionally we will send emails to list members from our marketing team, regarding updates to Surpass and events happening in the assessment sector. If you would like to receive these messages please tick this box. I would like to receive marketing messages.